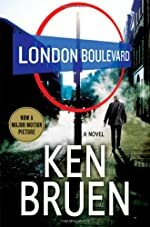 A trailer has been posted today for the film adaptation of Ken Bruen's thriller London Boulevard. Starring Colin Farrell and Keira Knightley, and written and directed by William Monahan, the film opens in the UK on November 26th; we're not aware of any US release date. Originally published in 2001, London Boulevard follows Mitchell (Colin Farrell), who's been released from prison after serving three years for a vicious attack he doesn’t even remember. Billy Norton is there to pick him up. But Norton works for Tommy Logan, a ruthless loan shark lowlife with plans Mitchell wants nothing to do with. Attempting to stay out of Logan’s way, he finds work at the Holland Park mansion of faded movie actress, Lillian Palmer (Keira Knightley's character in the film is, instead, a reclusive young actress), where he has to deal with her mysterious butler, Jordan. It isn’t long before Mitchell’s violent past catches up with him and people start getting hurt. When his disturbed sister Briony is threatened, Mitchell is forced to act.